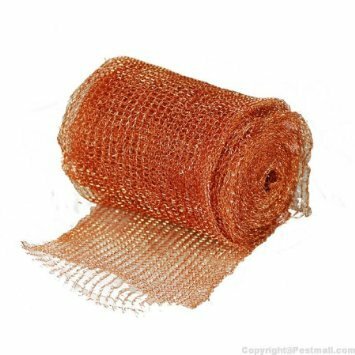 Stuf-Fit Copper mesh is a kind of knitted wire mesh. It is designed to stuff all kinds of openings to stop pests, bees, insects, rodents and other similar unwanted animals. Once tightly packed in a hole, crack or gap, the copper mesh refused to be pulled out. This copper wool has special interlocked structure. You can tack it, staple it or glue it to any openings. Compared with steel wool, copper wool has two advantages. First, its knitted construction often catches rodents' teeth and makes it hard for them to chew through or remove. Second, copper mesh never rusts. Roll is 100 foot long and about five inches wide. If you have any questions about this product by FlyBye Copper Mesh, contact us by completing and submitting the form below. If you are looking for a specif part number, please include it with your message.